Vikings, Alfred the Great and ninth-century England – The Last Kingdom (BBC; based on the Saxon Stories by Bernard Cornwell) will undoubtedly spark an interest into the Anglo-Saxons. On this blog, I will regularly discuss some of the historical and/or cultural background of The Last Kingdom, without major plot spoilers. 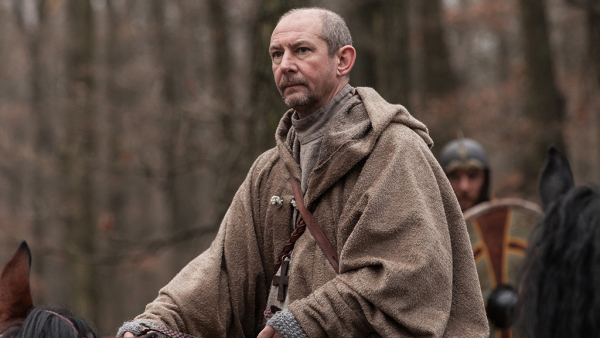 In the first episode of The Last Kingdom (UK airdate: Thursday, 22 October, 9 pm, BBC 2), the priest Beocca tells the young Uhtred that he should have the boy ‘swear by Cuthbert’s comb’. This post deals with the real Anglo-Saxon object that served as the inspiration for this remark: the comb of Saint Cuthbert. Saint Cuthbert of Lindisfarne is one of the most famous Anglo-Saxon saints. He spent most of his life on the islands of Lindisfarne and Inner Farne, where he combined the roles of hermit and bishop. He is fascinating for many reasons, but what stands out most for me is his relationship with animals: otters licked his feet, he shared a fish with an eagle, his horse found him some food and crows gave him hog’s lard (which he used to polish his shoes with). He died in the year 687 and he was buried in Lindisfarne. When his coffin was opened 11 years after his death, his body was found to be fully intact: proof that he was indeed a saint. He was put in a new coffin, which was placed inside the church, above ground, near the altar. Cuthbert’s coffin has a long and exciting history (that we will skip for now) and, after an eventful sojourn through England, ended up in Durham Cathedral. In 1827, the grave in which Cuthbert was thought to have been reburied was opened and they found his bones (no longer intact, this time), along with various relics, such as a travelling altar, a gospel book (now in the British Library), a pectoral cross and an ivory comb. Cuthbert’s comb is about 16 cms long and 12 cms wide, with coarse teeth on the one end and fine teeth at the other. This seventh-century comb is an example of a ‘liturgical comb’, which priests would use to fashion their hair prior to celebrating mass. Scholars have noted certain similarities to Mediterranean combs of the same period; this, along with the fact that the comb was made of elephant ivory, demonstrates the big Mediterranean influence on Anglo-Saxon monasticism (on Cuthbert’s comb, see MacGregor 1985: 79). The ivory comb is described for the first time by the twelfth-century Benedictine monk and hagiographer Reginald of Durham (d. c. 1190), who wrote a book about miracles attributed to Cuthbert. He records an interesting story about how the comb was used to tame the deceased saint’s ever-growing hair. A tenth-century monk named Elfred, Reginald reports, would occasionally open Cuthbert’s coffin in order “to cut the overgrowing hair of his venerable head, to adjust it by dividing it and smoothing it with an ivory comb and to cut the nails of his fingers, tastefully reducing them to roundness”. Reginald also tells us that Elfred would now and again show some of his cuttings to his friends and hold the saint’s hair in flames. Exposed to the fire, Cuthbert’s hair would glisten like gold; cooled down, it returned to its former hairiness. Reginald further tells us that “the ivory comb, perforated in its centre” was placed in Cuthbert’s coffin (source of story: here) – where, apparently, it still was in 1827. 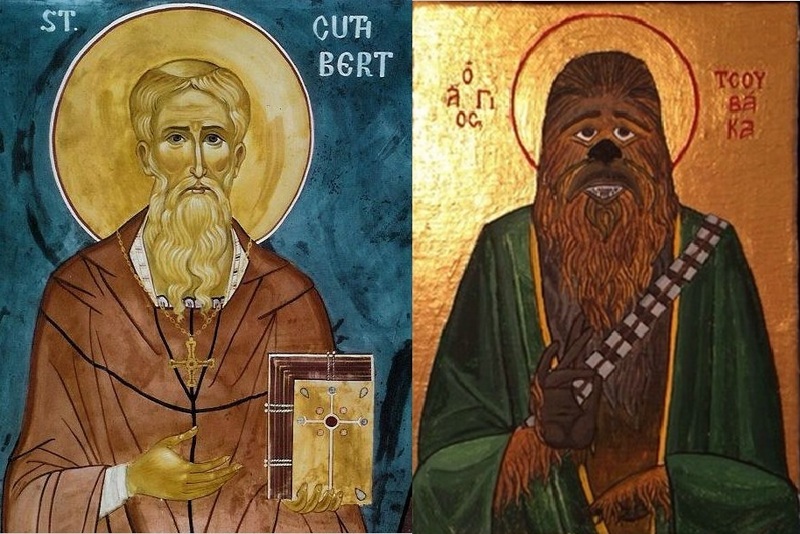 So there you have it: Cuthbert’s comb is well worth swearing by, if only because it allowed a tenth-century monk from keeping St Cuthbert from becoming St Chewbacca. MacGregor, Arthur. 2015. Bone, Antler, Ivory & Horn: The Technology of Skeletal Materials Since the Roman Period. Abingdon: Routledge. By thijsporck in Anglo-Saxonism, Breca the Pug, Saints, The Last Kingdom (BBC) on October 22, 2015 . Glad you liked it, Chris! Still trying to find my way through blog land. Chewbacca is not my own handiwork but something I found on the interwebs (hence the source link in the caption).